Is your heart fit for sport? Hypertrophic cardiomyopathy is the commonest cause of sudden cardiac death in young people. Every year many young sportspeople across the world die from this and other cardiac conditions. 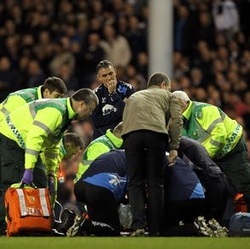 Most people who have a cardiac arrest do not have the high level of medical support that is immediately available as it is at large professional sporting events. There are other heart conditions that can cause sudden cardiac death in young people (such as the well known case pictured). Many of these conditions can be screened for with a professional opinion with a cardiology consultant and some simple tests such as an ECG and echocardiogram. Such screening is routinely done for all young sports people in some countries (for example Italy) but is not routinely done on the NHS at present. Our cardiologists have a well established track record in providing screening for individuals, clubs and larger organisations. Do you have a family history of heart problems and want screening to ensure your heart does not have a serious underlying condition? Do you have an existing heart condition and want to know if you can partake in a sporting event such as a marathon? We would be happy to see individuals who self-refer or who are referred by their GPs via the standard route (new patient consult with ECG, see here for standard fees), who have any concerns about their cardiac risk when participating in any level of sport. After the initial consultation then any other tests could be organised, as felt necessary by the consultant, at the standard fees (see here for standard fees). Please contact us here for more information. If you are an individual athlete, wanting to self-refer for screening this should be done via the standard route as outlined above. Wessex Cardiology have an established track record in this and have provided screening for Southampton Football Club, Portsmouth Football Club and Hampshire County Cricket Club. Screening of teams/squads of professional athletes is usually negotiated by the professional athlete's club as part of screening for the whole team/squad. We would be happy to provide a tailor made screening service service to suit your team's needs. Please contact us here for more information.